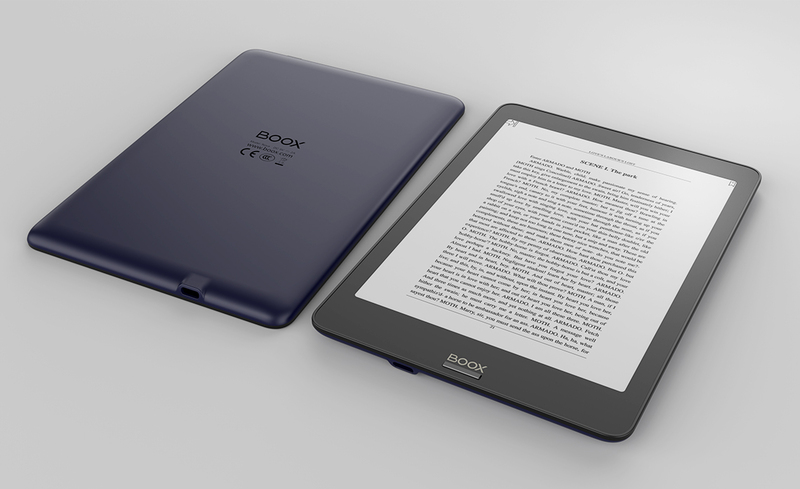 The First Versatile eReader That Contains Dual Touch and Front Light. 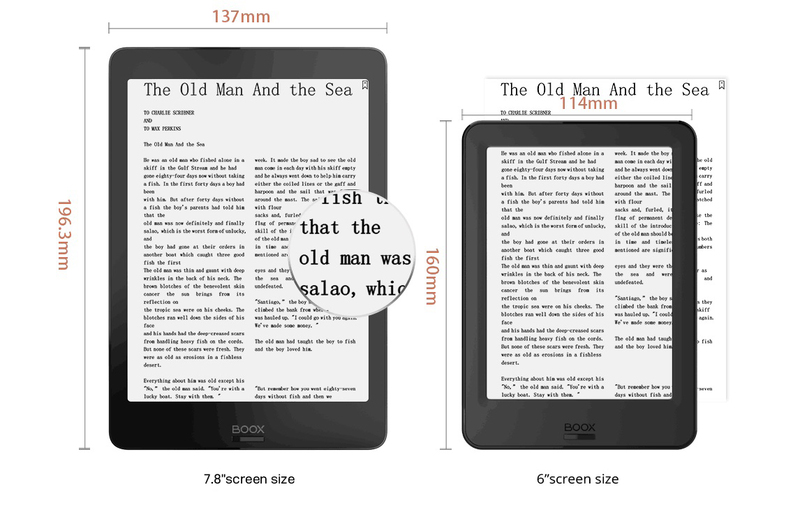 7.8” Paperlike eReader: Flush glass-based screen with high resolution 1872 × 1404, be viewable without glare from any angle to the screen. Front Light: Allow to read in the dark and day via the front-lit display, with an adjustable color temperature system. Dual Touch: Both electromagnetic touch and capacitive touch are supported that it is easy to manage with stylus and fingers. 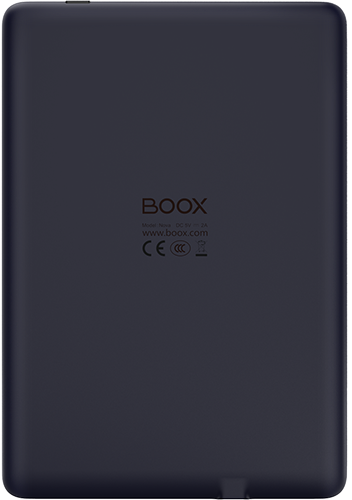 Android Based System: High-performance Android eReader with 1.6G of Quad-core, 2GB of RAM and 32GB of storage. 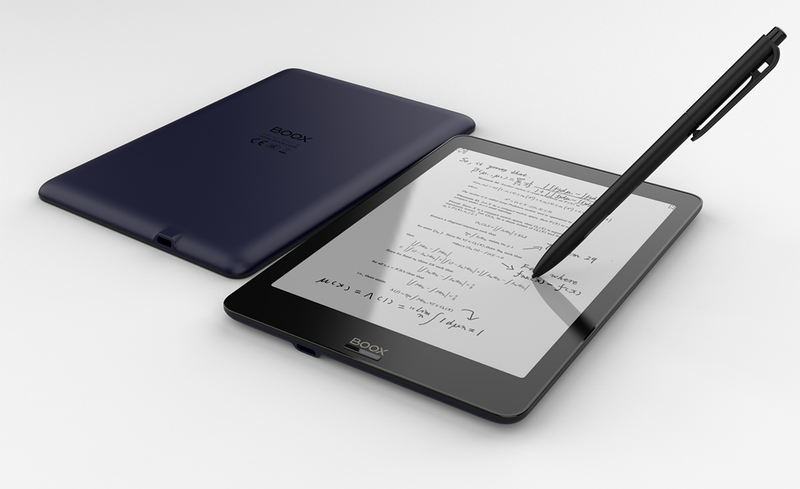 Electromagnetic touch and capacitive touch allow writing with a stylus and operating with fingers on the portable eReader. Front Light with Adjustable Color Temperature System Make You Enjoy Reading in The Day and Night. 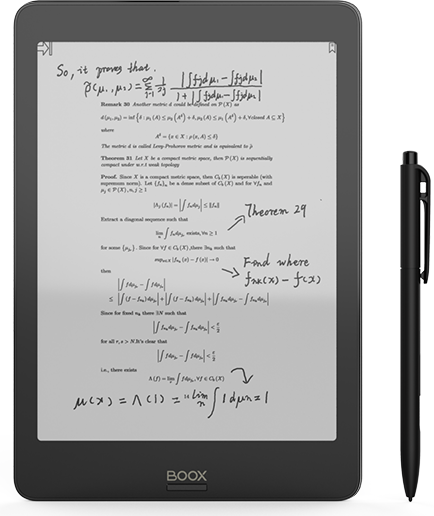 7.8″ display fits more text than general size eReaders, and it is more portable compared to other large screen models. 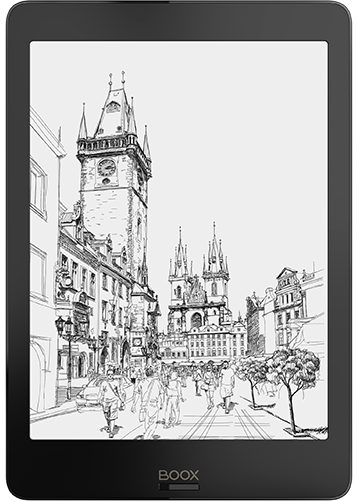 300 pixels per inch, the highest resolution of all E Ink screens, provides sharper and darker text. Unlike smartphones and other tablets with reflective LCD screens, the Nova Pro screens are readable directly in the sunlight like on real paper. Unlike the LCD screens emitting blue lights to your eyes, the Nova Pro screen reflects ambient light from the environment to your eyes. You can comfortably read for longer hours without eyestrain. Nova Pro screen displays more text than the regular 6-inch eReaders do. For books with same-size fonts, users can be more concentrated due to fewer page turns. Supported formats: PDF, ePub, MOBI, Doc, Docx, Docm, TXT, DjVu, FB2, HTML, CHM, AZW, AZW3,FBZ, ODT,PRC, RTF, SXW, TRC , JPG, PNG, BMP, TIFF, CBR, CBZ, WAV, MP3. You can highlight and annotate the sentences that are important to you. You can also bookmark the whole pages and look up dictionaries when you come across new words. 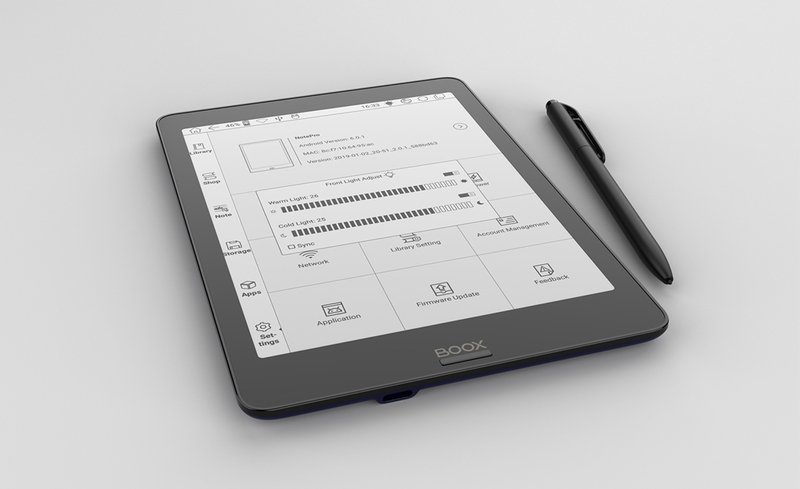 With both capacitive touch and Wacom stylus touch, Nova Pro allows users not only to take notes, sketch, and draw, but also to make handwritten notes directly on top of PDF books. After 10 years, we finally introduce a new user interface design. The new layout of the new user interface is more interactive and easier to use. We aim to be the best. We always strive to keep abreast of the tablet hardware upgrade pace. Our leading hardware solution in eBook Reader industry greatly shortens the device response time even when you operate it like a normal tablet. No more waiting, enjoy your Nova Pro at ease. Connect your Nova Pro with Bluetooth speaker, then enjoy music and audio books whenever you want. Feel tired of reading books? Our text-to-speech feature reads the book out loud for you from where you left. 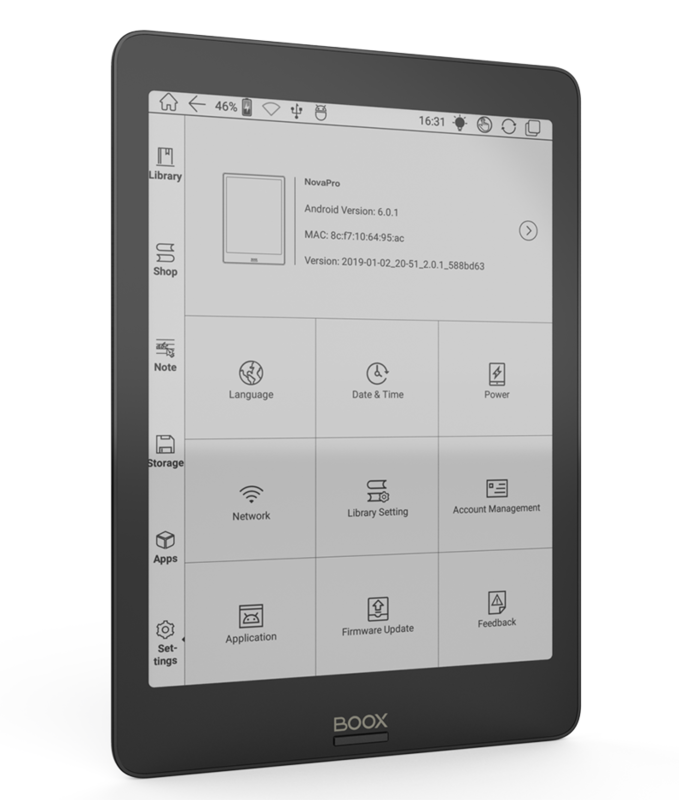 In order to provide better user experience to the third-party Apps on BOOX, we introduced BOOX EInk App Store from firmware V1.9.1. The Apps downloaded from the store would be more compatible with slower-refresh E-Ink screens. Up to the trend, Nova Pro is equipped with the new generation of USB Type-C. No more fumbling! Users can plug the connector in either way. By MTP support, you still can use your Nova Pro while transferring data between your Nova Pro and your computer.